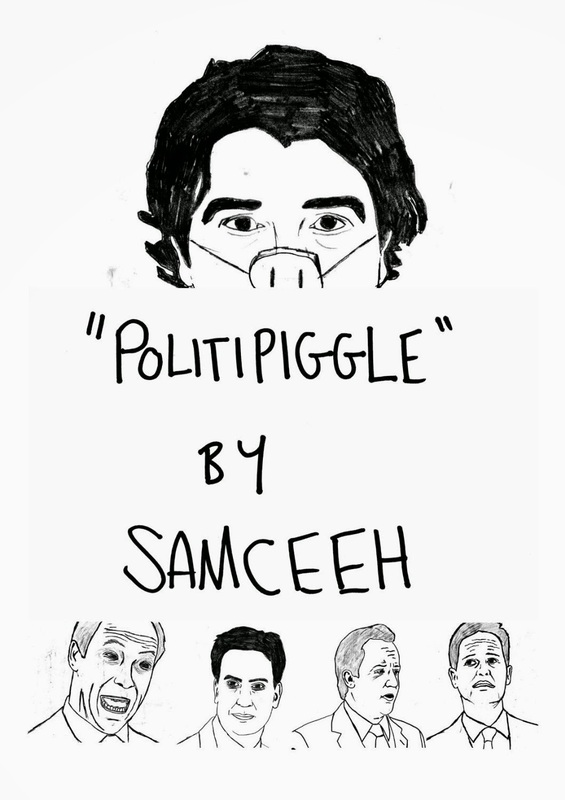 Today we are interviewing Samceeh, author of the political humour/cartoon book Politipiggle. Hi, my name is Samceeh, and I'm the creator of Politipiggle. I'm usually a novelist- cartoons and artwork is something of a departure from the norm for me. Describe the purpose of Politipiggle in a few sentences. I wanted to cut through the spin and coverage and help people perceive establishment figures in a new way. These images, these outlines…this is what they are when the curtain is pulled back. Politipiggle reduces politicians to people. Who do you think would most appreciate Politipiggle? Anyone interested in UK politics, and anyone keen for a fresh perspective. You include a wide range of public figures in your work, from Emma Watson to the Pope. How did you decide who to include? I didn’t decide all of them—the media did that for me. The big names like Cameron, Miliband, Clegg, those ones I picked. But half of the faces are in there because they’ve made their voices heard this year in the build up to the election. I was also constrained by time—I only had the idea for PP around December last year, and it has taken so many evenings after work relentlessly working to get it completed in time. What was the creative process like for Politipiggle, from the initial idea to the published book? In my day job I work in depth with newspapers and media outlets of all shapes and sizes. It means I’m constantly reading news articles, many of them about politics. I can watch a story break as it happens, watch it spread and get syndicated. When something worthy of a Politipiggle came up, I’d make a note of it. Then I would craft the image. And finally, I’d add the statement. And onto the next! How do you think reading Politipiggle will impact people? I’m hoping it will give people a little bit of fresh perspective. In a society that is constantly bombarded by campaigning in the build up to the election, I’m hoping PP will help people take a step back. I’m currently editing a novel based on some time I spent in Cambodia. Images are merely for illustration in this one though! Is there anything else you'd like potential readers to know about Politipiggle? Only that Politipiggle is a work of love. And if you have any interest in UK politics, I think you’ll love it too.